HomeBlogClick boardsPressure 6 click, a highly accurate pressure sensor perfect for simple reading. 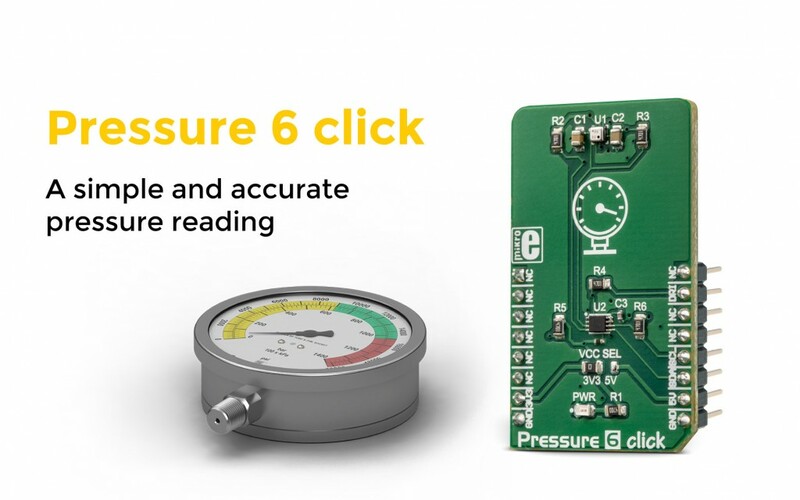 Pressure 6 click, a highly accurate pressure sensor perfect for simple reading. We’re happy to announce our new sensor click dedicated to pressure measurement. Pressure 6 click features a simple, yet highly accurate and reliable pressure sensor labeled as BM1386GLV, produced by ROHM. Being a piezo-resistive pressure sensor with internal thermal compensation, it’s perfect for a simplified pressure reading. It’s also a very fine sensor, as it allows readings in the range from 300hPa up to 1300hPa, with the accuracy of ±0.12hPa. The Click board™ comes as a fully tested and approved prototype, making it a reliable device ready to use on the development board. The full package also includes the mikroSDK™ software and a library with all the functions. The click is perfect-to-use for developing the industry-related applications, as well as in the healthcare applications, mobile devices, smartphone apps, and similar.